La Mesa City Council incumbent candidates Guy McWhirter and Bill Baber — and Mayor Mark Arapostathis, although a write-in candidate upset is highly unlikely in the unopposed race — want voters to focus on the city’s recent accomplishments, their combined experience in the city and the good working relationship the three have together. McWhirter also pointed to the group’s deep roots in the city. McWhirter questions whether challenging candidates Dr. Akilah Weber and Dave Meyers are planning to stick around or if they have greater political ambitions. He also wonders about their history of serving the community. “What have they done in the years that they’ve lived here?” he asked. Arapostathis pointed to his service to the community as a teacher, running a children’s theater, starting the La Mesa Arts Academy, and working with the city’s parks and recreation department before he was elected to city council. “Running for city council wasn’t a long-term plan but what happened was, I started serving with the city more and more and I was encouraged to go that direction and so I did,” he said. Because of term limits, Arapostathis said the “clock is ticking” for him and his fellow councilmembers who are trying to get as much accomplished while they are able to serve. “I care about what happens to the city, we all care,” he said. In March of this year, La Mesa adopted a Climate Action Plan (CAP) that was more than four years and multiple drafts in the making. “I’m proud of our Climate Action Plan,” Baber said, adding that before he was elected to the council, the plan had “gone dormant” due to a lack of city staff to work on it. He and Councilmember Kristine Alessio formed a subcommittee to work on the plan and struggled with consultant AECOM, who Baber described as “mildly helpful.” The city took in lots of public input and worked the plan through the Environmental Sustainability Commission before passing East County’s first CAP. Baber noted that although there are still a few critics of the CAP who say it did not go far enough, he said “La Mesa is doing its part” to reduce greenhouse gas emissions. As members of the downtown subcommittee, McWhirter and Arapostathis pointed to the resurrection of La Mesa Village as a major accomplishment. The city’s streetscape project that gave the downtown Village a facelift raised rents that pushed out old businesses and brought in new ones as La Mesa became a “cool place to be,” McWhirter said. But the transition wasn’t easy for a lot of business owners who had to deal with closed streets and construction noise that kept customers away. “That was a tough 18 months for the three of us because we were doing a lot of hand holding with the businesses,” Arapostathis said. The investment has paid off. New businesses have taken root along La Mesa Boulevard and customers have returned to shopping and dining there. “The percentage of failures on our boulevard is much, much lower than the national average for businesses,” McWhirter said, adding that other East County cities are jealous of the Village’s success. One of the criticisms that Dr. Weber and Myers have levied against the incumbent candidates is that the city council’s focus on downtown has left the west side of La Mesa neglected — a charge that the incumbents reject. Arapostathis said the city has been moving forward with development in the west side, noting the recent stormwater drain project and pedestrian traffic improvements on University Avenue. He said the plan to improve west La Mesa is the same as downtown — make capital improvements so more businesses move in. Arapostathis said other improvements for the west side will come from recent council votes, such as adopting Vision Zero to reduce and eliminate pedestrian fatalities by investing in new crosswalks and other safety measures; and new energy-efficient lighting in the west side as part of the CAP to reduce crime. “The PD [police department] has reported a vast improvement when they are out patrolling because it puts light in areas where it was darker,” he said. The city is also changing the street lights on University Avenue and El Cajon Boulevard from pressure sensors to optical sensors that will reduce idling and make traffic along the corridors much smoother. McWhirter expects the capital improvements along the corridors, as well as the investment in the Village, will eventually attract more businesses to the west side. Housing across the entire San Diego region is becoming sparse and as La Mesa’s profile keeps rising with new businesses, so does its profile with developers — and sometimes to the chagrin of existing residents. Arapostathis said the power to control housing density is being gradually taken over by the state and pointed to the recent Little Flower Haven development as an example. Although citizens and neighbors of the project opposed the development due to the effect it will have on parking, city council had to approve it anyway because the developers took advantage of state rules allowing reduced parking spaces. Although it was a cementitious vote on an unpopular project, McWhirter said it could have been worse. 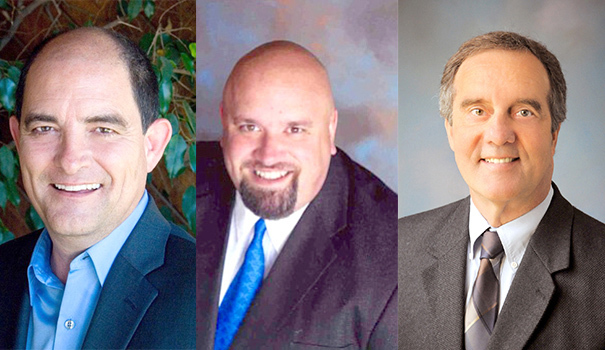 All three candidates said they do not want to change existing height restrictions for housing projects and are encouraging development along freeway corridors and in places that won’t impede La Mesa’s small-town feel. When it comes to whether the city should build an expanded library, all three candidates said they are not opposed to the idea but wonder about funding and whether a traditional library is what is needed. “One thing is that libraries are changing. They’re important to cities but they’ve changed. And what I’ve heard from most of the people that are asking, they want something more like a community space,” Arapostathis said, adding that he prefers investing in a performing arts center, but one that could be connected to a library. “Right now, there doesn’t seem to be a funding source, so the only funding source we’re looking at is possibly a bond,” he continued, adding that a possible funding path would be a joint venture with the school district and county to make a city-owned, county-operated library. McWhirter said that although some people think the city had promised a new library, it was really a promise to pursue state library development funds for one. “That temporary library became the permanent library because the funds we would have had to build the new library were taken away by the county,” he said, adding that the city applied for state library grants before they dried up in 2009. In 2016 when voters passed Proposition U allowing the sale and production of medical cannabis in La Mesa, it forced the hand of a city council that had previously opposed such businesses. It also forced the city to implement an ordinance written by cannabis advocates and not by the city council. “If we could have looked back and passed an ordinance, we would have limited the amount of exposure the city had and crafted something a little more dynamic that could serve the city better,” he continued. The city is currently drafting an ordinance to allow adult use cannabis businesses. Although McWhirter has often opposed cannabis to “resist another form of people getting out of control,” he said he will vote to support an adult use ordinance. “Right now we have [legal cannabis] and I’m supporting our city for doing what it’s doing,” he said. For more information about Bill Baber, visit baber4lamesa.com. For more information about Guy McWhirter, visit facebook.com/guymcwhirter4lamesa. For more information about Mark Arapostathis, visit bit.ly/mark-lamesa.